"The 18th century witnessed a revival of tribalism, internecine feuds and the fragmentation of Persia. The establishment of the Qajar dynasty (1779-1924) by Agha Muhammad Khan, the leader of one of the Qizilbash Turkmen tribes who had originally helped the Safavids to power, reconstituted a centralized monarchy, consolidated most of the territorial gains of the Safavids, and marshalled Iran's strategically important position in the modern era." ​ "By the early 1780s Aqa Muhammad Khan was master of the northern provinces. Overcoming rifts among the Qajar clans and among his many brothers, he successfully mobilized the frontier Turkomans and other affiliated tribes of the north into an effective army. In 1786 he made the strategic town of Tehran his capital, before pushing south to capture Isfahan and Shiraz in a series of campaigns against the Zands. Prevailing over most of his rivals (with the exception of the remainder of the Afsharids in Khurasan), he brought to a halt the long and destructive civil war, put an end to the quarreling Zands, and unified Iran under a stable rule by the mid-1790s." "The Qajars came to power after a period of anarchy and tribal (uymaq) struggles to control the Iranian state. Their regime was never consolidated. Their armies were composed of a small Turkoman bodyguard and Georgian slaves; the central administration was a court government too little developed to effectively tax the country. The provinces they ruled were fragmented into innumerable tribal, ethnic, and local factions headed by their own chieftains. Khans and Ilkhans governed their own tribes. A combination of formal governmental appointments, control of land, rights to collect taxes, and the power to administer justice and mediate disputes made tribal chiefs virtually independent of the state. The authority of Khans was by no means absolute since it also depended upon the ability to rally support from lesser chiefs who had to be coerced, cajoled, bought off, or otherwise made allies of the paramount Khans, but it was often sufficient to assure their autonomy. ... The new regime, moreover, never captured the aura of legitimacy which had inspired Safavid rule and never managed to fully establish its control. Effective local power remained in the hands of tribal chiefs, officials, and landowners, while the Qajars maintained their suzerainty by exploiting the rivalries of lesser chiefs." "The nature of the military forces of the Qājārs did not contribute to stability. As in earlier times, the army was largely formed by provincial contingents and irregular cavalry and infantry, with a small body of regular troops. There was no clear dividing line between the provincial governor, the tribal leader, the landowner, and the military commander. This facilitated rebellion and made the control of the shah always precarious. Āqā Muhammad Khān's total forces probably did not exceed 70-80,000 men and his revenues were so small that he could not maintain them for more than six or seven months of the year. Their principal arms were bows and arrows, clubs, lances, swords and daggers. The cavalry wore coats of mail and some used small shields. Fire-arms consisted of long muskets, mostly matchlocks." "The cavalry of Iran was described in 1805 by Napoleon's emissary to Persia, Colonel Alexandre Romieu as 'the best in the entire Orient.' The irregular cavalry hailed from western (i.e. Lurs, Bakhtiaris, etc) and eastern Iran (i.e. contingents from Khorasan, Turkmen, Baluch, etc). The total number of cavalry was estimated as ranging between 140,000 and 150,000 with the tribal element of the cavalry numbering 80,000. Their weapons are generally described as being very long guns, lances and shields. Colombari notes that by the time of Mohammad Shah, the army was able to raise 190,000 tribal cavalry. Each tribe was expected to provide a cavalry contingent at times of war with cavalrymen being expected to provide their own mounts, however salaries were provided to these when engaged in government service. In peacetime, cavalry units would be generally available for full-time service for around two months of the year before retiring to their homes in winter." ​ "Caucasus pistols were also used in north-east Iran, which lies near the Caucasus mountains. [SIC] These pistols were made mainly in Dagestan, which was famous for its products. Many pistols had European locks." "From the end of the seventeenth century, Persian infantry and artillery units had firearms and had been trained by European instructors. The tactics and equipment of the cavalry, however, had remained decidedly obsolescent, with only the quality and beauty of the armour, mail and sabres reaching their pinnacle in the eighteenth century. [CONTRA Black 1999 p28] The basic weapons of upper-class Persians were the lance, composite bow and sabre. [...] The chair aina (four mirrors) armour was so named because it consisted of four plates: breastplate, backplate, and one under each arm, and it was worn over a fine mail shirt. 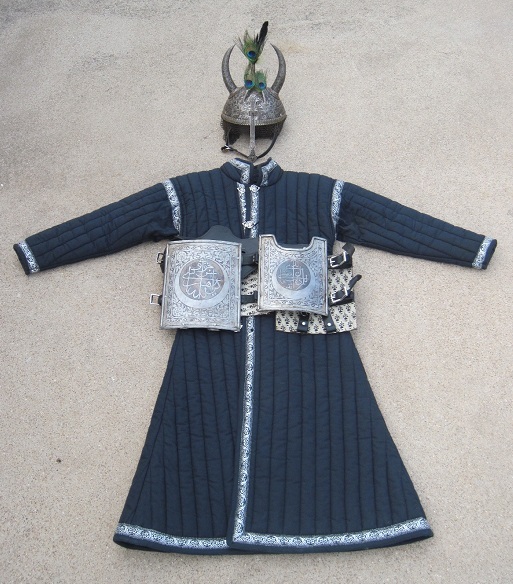 Also part of the protective equipment was a helmet (sisak), traditionally ornamented with bird feathers, a round shield with four bosses, and a right-hand guard (majsur)." "Spears, lances, combat forks, javelins Pole arms were an important element of the armament of the Persian and Mogholian army. Many miniatures from these countries show battle scenes in which warriors use long lances. Specimens that have survived up to this day (rarely with the shaft) are from the 17th century and later. A number of lances with heads of various shapes are in the exhibition in Bern. Most of them have authentic shafts made from hardwood or bamboo. The tassels are horse-hair, silk or cotton. The tassels at the head mounts were for decoration and were also helpful when extracting the weapon from the enemy's body." "These types of weapons were often used in Iran and Moghul India. The specific types of each group of weapon were identical, or were similarly named in both countries. 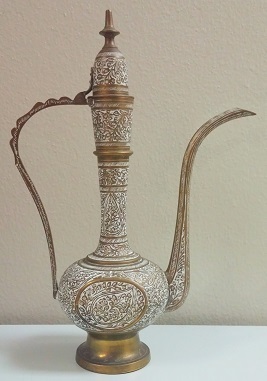 Only in the case of decorated specimens, is it possible to distinguish whether it is of Indian or Persian origin by examining the types and techniques of the decorations." "Between them, they [Qajar arms and armor including axes and maces] freely mix Avestan and Zoroastrian demons, sacred bulls, and dragons with Quranic verses and Shi'a symbols. An attentive observer might liken this mix to pre-Christian Greco-Roman iconography appearing on 'Christian' European weaponry of the Renaissance and later ...."
"Persische Säbel -- Shamshir (Löwenschweif) und Scimitar gennant -- haben eine besonders stark gebogene, schlanke, sich sehr verjüngende Klinge ohne Hohlschliffe. Die Pfeilhöhe ist also besonders groß. Das obere Griffende knickt stark nach der Schneidenseite hin ab und ist oft mit einer Griffkappe versehen. Die geraden Parierstandigen erweitern sich zu einem breiten Mittelschild." "Shamshir und scimitar sind verschiedene Namen für den persischen Säbel mit stark gebogener Klinge, der ziemlich schlank ist und zur Spitze hin noch schlanker wird. Die Proportionen der Klinge erkennt man daraus, daß die Länge in diesem Fall 77 cm beträgt und die Pfeilhöhe 9,5 cm." "SIPAR. 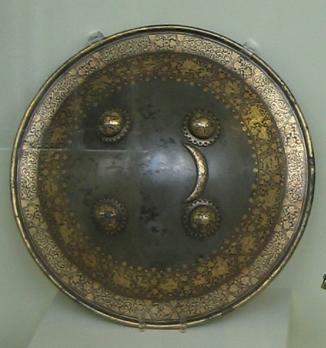 Persian, a shield. It is the same as the Indian Dhal. 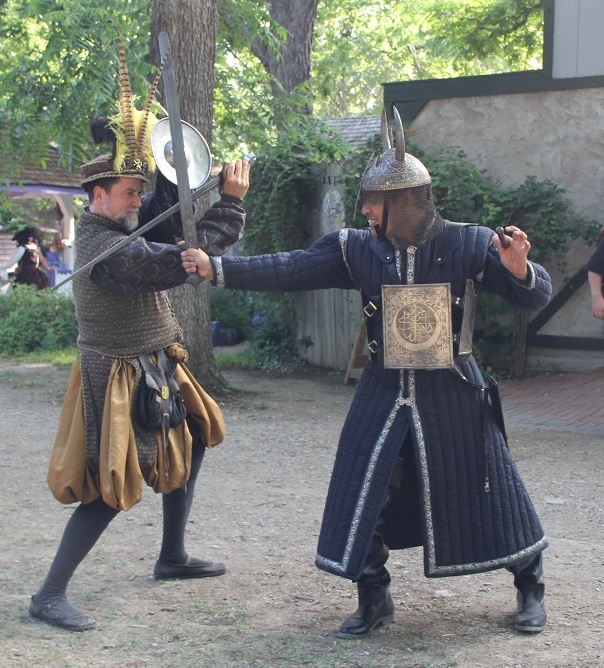 Occasionally the Persian shields have three handles so that they can either be held in the hand or carried on the arm." "Separ, dhal, darque[:] These names refer to all types of Persian and Moghul shields from the 17th-19th centuries. The shields were 35-60 cm in diameter and were often crafted from bulat, thick leather or papier mache (these were painted and decorated with a gold ornament). Separs had four decorative buttons that ended the rods going through the shield. The inner surface was padded; there was a small rectangular pillow protecting the arm. 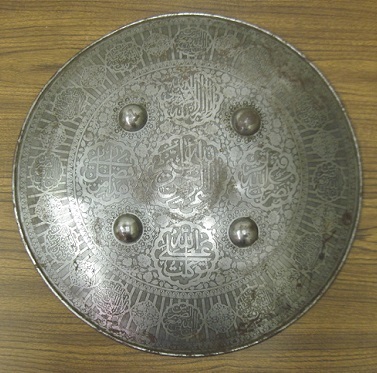 Metal shields were decorated either with a floral ornament or with damascening or engraving." "Hecмoтpя нa пapaднoe oфopмлeниe, пoдoбныe щиты coxpaняли бoeвoe знaчeниe в иpaнcкoй кoнницe вплoть дo нaчaлa XIX в." "Besides the ordinary curved 'Shamsher,' the Persians use a straight sword with the quillons downwards." "Apart from scimitars, double-edged swords called quaddare were also used in Persia. ... [One type] had a flat blade, was often decorated with an acid etched letter ornament and had a symmetrical, metal hilt with a small pommel. 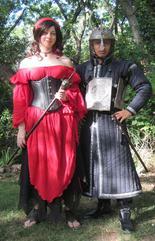 The quillon ends were curved in the blade's direction." "There is a widespread belief among collectors in Europe and North America that these swords were made in order to revive a tradition that reached back to the early Islamic era when Qajar smiths were imitating early Arab swords. Hence, these swords are known as 'revival swords' in these circles. The rationale behind using this term is that thse swords are an imitation of the early Arab swords, the revival of older traditions of the early Islamic caliphates. ... However, there are some arguments against this concept. "[W]hile indisputably a uniquely Qajar Persian phenomenon, the sword is structurally inconsistent with earlier Persian straight swords, despite Khorasani's insistence on that lineage. Since Timurid times Persian sword blades were hilted by fitting a quillon block at the shoulders, riveting slab grips to the tang, and adding a separate pommel. Again, this construction is consistent with other swords and sabers in the Turco-Mongol military tradition. "Judging by the weight, COP (center of percussion), and POB (point of balance) of late Iranian straight swords, they were obviously meant for chopping rather than draw cutting. Additionally, the rounded blade tip on many examples evidences the fact that these swords were clearly not intended for thrusting." "Some hilts of Persian khanjars are made of walrus tusks and have figural scenes sculpted on them, others are made of steel decorated by damascening." "The khanjar, with its graceful curve, is one of the most beautiful weapons among Iranian arms. Most Qajar examples have an I-shaped handle and an aesthetically curved blade, and the majority of the blades exhibit a central midrib. Yet examples with fullered blades also exist. The strong blade is normally made of crucible steel and has a midrib; sometimes, the edge of the area close to the forte is strengthened and left unsharpened, creating a double-fullered visual effect. 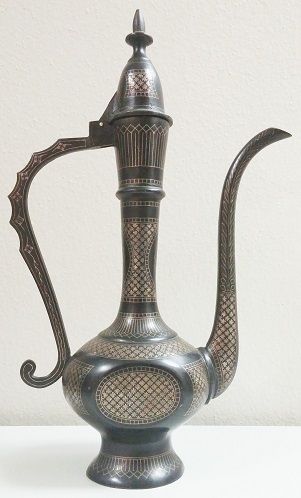 Although the majority of khanjars have watered steel blades, there are also examples of plain steel (high carbon) blades. Customarily, the tip thickens, and the midrib goes directly into the tip of the blade, ending there. ... The blade is straight for the first half, whereupon it curves strongly. In general, the grip is made of one solid piece of walrus ivory. There are examples with all-metal handles as well." "There is normally no loop for hanging the khanjar since it is tucked in the belt, sash, or girdle so that only the grip is visible. According to Zeller and Rohrer, the khanjar is carried either on the right or left side but never in the middle; however, they add that the majority of the figures with khanjars carry this dagger on the right side. A 19th century Qajar period painting of Mohammad Hassan Khan shows him wearing his khanjar tucked under his belt on the right side. There is a Qajar painting from the 19th century, entitled A Prince and a Servant. The prince in this painting is shown with a khanjar tucked under his belt on the left side. Since he is resting his left hand behind the grip, it seems reasonable to assume that he is left-handed, hence the positioning of the khanjar on the left side. Allan and Gilmour quote Binning, who traveled to Isfahan in the middle of the 19th century and reported that two different types of daggers were worn: a curved, double-edged dirk (clearly referring to a khanjar) stuck in the girdle on the right side and the kard, a straight, single-edged, pointed knife carried on the left side. Jacob states that Iranian warriors carried both knives or kards and daggers or khanjars, the latter being more famous. He further states that it is unlear whether this curved-bladed Iranian dagger influenced the Arab dagger or vice versa. "Le Kard persan, couteau ou coutelas à lame droite, tranchant unique, de longueur variable (entre 15 et 45 cm), à poignée en os ou en ivoire parallèle au dos et déviée vers celui-ci par rapport à l'axe central de la lame. L'acier de cette dernière, généralement damasquinée, est de très bonne qualité. La pointe de ce couteau est souvent renforcée de façon à ce qu'il puisse transpercer une cotte de mailles. [CRITICAL THINKING QUESTIONS: Is piercing mail with a knife even possible? If so, why is there no evidence of it?] L'une des particulairités de ce couteau est que le fourreau, en cuir ou en velours avec garnitures métalliques, atteint et dépasse la moitié de la virole terminant le manche vers la lame, si bien que lorsque le couteau est engainé, on ne distingue pratiquement que le manche." "A very elegant single-edged knife used extensively in Persia was the kard. This has a blade of watered steel, often chiselled with palmette scroll reliefs near the hilt. The grip consisted of bone or ivory plaques but had no guard, simply slotting into the top of the scabbard. It is not known when the kard was first introduced in Persia but there are examples bearing dates in the early years of the seventeenth century. However it seem [SIC] to have been especially fashionable in the second half of the eighteenth and early nineteenth centuries." "KARD. A straight-bladed Persian knife with a straight hilt and no guard. The point is often thickened to permit it being forced through mail. [CRITICAL THINKING QUESTIONS: Is piercing mail with a knife even possible? If so, why is there no evidence of it?] They vary much in size and shape and are often of fine workmanship." "Most collections of Eastern weapons include examples of the Persian short dagger known as a 'Kard'. The blades are usually of watered steel, the grip being formed of two plaques of bone or morse ivory held by rivets. The more elaborate of these daggers have finely chiselled scrolls and arabesques on the blade near the grip, the blade being straight and single edged with a flat back. A number are inscribed with the makers' names and dates. The majority of the dated examples were made around 1800."